Function: Expels wind-heat, subdues wind, opens the orifices, removes obstructions from the channel, promotes lactation. Indications: Headache, febrile diseases, loss of consciousness, redness of the eye, cloudiness of the cornea. Function: Eliminates interior wind from the Governing Vessel, expels exterior wind, benefits sinews, resolves dampness and jaundice, clears the mind. Function: Removes obstructions from the channel, eliminates damp-heat. Function: Clears mind, removes obstructions from the channel, expels exterior damp-heat. Function: Benefits the sinews, brightens the eyes, removes obstructions from the channel. Function: Removes obstructions from the channel, calms the mind. Function: Resolves damp-heat, removes obstructions from the channel, calms the mind. Indications: Headache, swelling of cheek, pain in nape, shoulder, arm and elbow, epilepsy. Function: Courses wind and quickens the connecting vessels, dissipates, binds and relieves pain. Function: Resolves Tai Yang channel pathogens, diffuses Qi stagnation in the chest and lateral costal region. Function: Frees the channels and quickens the connecting vessels. Function: Soothes the sinews and quickens the blood. Function: Courses wind and quickens the connecting vessels, warms the channels and dissipates cold. Function: Diffuses the lung and clears heat, transforms phlegm and brightens the eyes. Function: Dispels wind and quickens the connecting vessels, quiets the spirit and nourishes the Heart. Function: Resolves damp-heat, expels fire-poison, removes obstructions from the channel. Function: Expels wind, relieves pain. Reducing fever related to Small Intestine meridian energy disruption, especially fever caused by malaria. 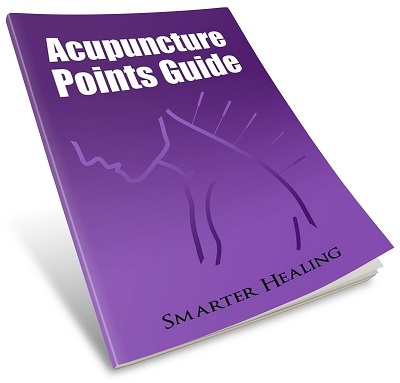 Alleviating pain along the Small Intestine meridian, including in the arm, axilla, shoulder, scapula, neck and throat, jaw, mouth, teeth, tongue, nose, cheek, eyes, and ears, which are all affected by this meridian. Reducing swelling, especially in the neck, throat, and cheeks. Treating breast disorders, and disorders on the side of the breast (lateral costal region). Along with its primary energy pathway, the Small Intestine meridian also has secondary branches of energy that spread out and influence other parts of the body. It also has a muscle/tissue zone called the sinews which it strongly influences as well. Let's take a look at these secondary characteristics of this meridian. First up we have the Small Intestine luo-connecting channel, which is located on the arm alongside the primary meridian. This secondary energy channel begins at the acupoint SI7, and then climbs the arm until it reaches its end on the side of the shoulder area. At its upper end point, this channel connects with acupoint LI15 of the Large Intestine Meridian. Next we have the Small Intestine divergent channel. This energy pathway separates from the primary meridian on the shoulder, near acupoint SI9. The pathway enters the chest area and passes through the physical heart, then goes downwards into the physical small intestines where it ends. Lastly, we have the Small Intestine sinew channel. This area of tissues that is strongly affected by the Small Intestine meridian begins on the little finger where the meridian itself begins at acupoint SI1. It travels up the arm in the same area as the primary meridian, attaching to the joints at the wrist, elbow, and shoulder area. It covers a large portion of the back shoulder blade area, then continues up the neck and onto the side of the head where it follows the pathway on the face of the primary meridian channel. A small sub-branch of the sinew channel separates from the main sinew channel behind the ear, and goes into the ear. Finally, the sinew channel ends on the side of the head near the top, very close to the acupoint ST8 of the Stomach Meridian.